The Cinque Terre, Porto Venere and the La Spezia’s Archipelago were proclaimed in 1997 as a World Heritage Site. Now, once again by the Organization of the United Nations, a new recognition comes: it becomes part of the prestigious list – this time as intangible elements – the art of dry-stone walls (“Dry stone walling”), which in the villages Riomaggiore, Manarola, Corniglia, Vernazza and Monterosso delineates the appearance of the coasts with its unique terraces. Agriculture, history, tradition are just some of the elements that this ancient world, handed down from father to son century after century, testify: their bold building, with the stones placed one above the other like a mosaic, without any cement, they have made possible the domestication of hostile lands. Thus the cultivation of the vine has developed, which still today produces fine wines, mostly white, with a salty flavor: the ripe grapes face the beauty of the Ligurian Sea, which absorbs its scent, and under a sweet and temperate sun. Even today, despite the scourge of abandonment that some realities like the Manarola Cinque Terre Foundation (www.fondazionemanarola.org) try to fight, this art continues to be fundamental for the maintenance of a unique coastline, which boasts few equals in the world. A show that combines nature and the work of man, which is worth a visit from every continent. 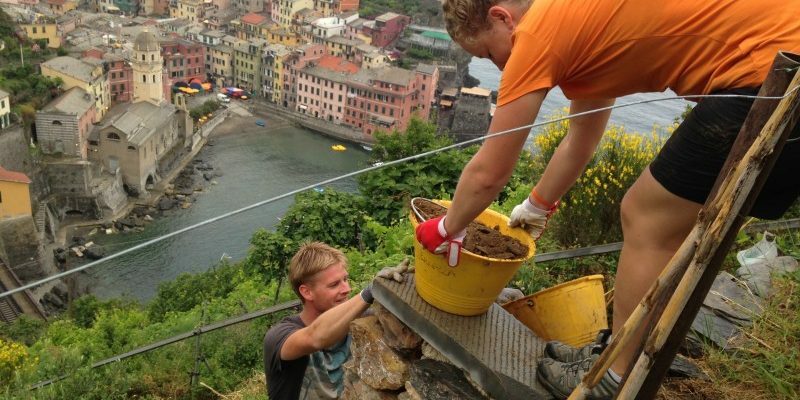 Do you want to help the inhabitants of the Cinque Terre in the maintenance of dry-stone walls?